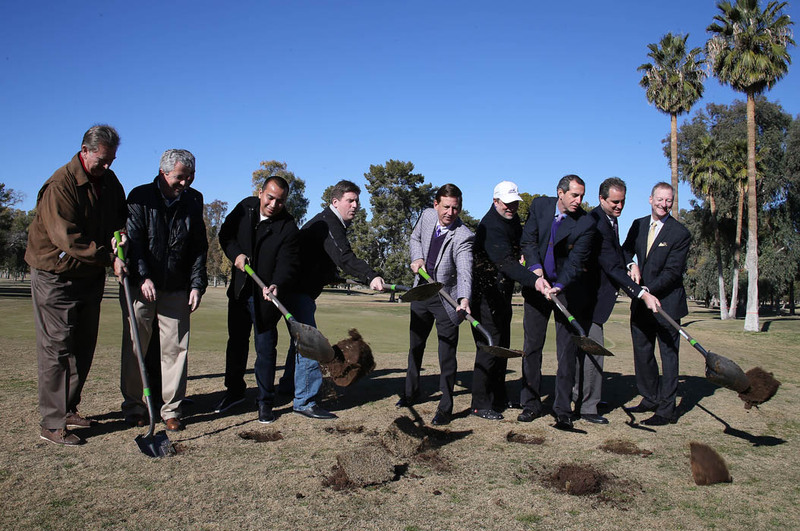 Phoenix city officials joined local golfers and Grand Canyon University leaders Friday to mark the University’s renovation of Maryvale Golf Course with a final round before the course is closed for a face-lift. In October, GCU announced its plans to revitalize the 1960s-era city-owned course, which is known for its large, mature trees and green expanses in the middle of urban west Phoenix. GCU will operate the course, renovate the greens, fairways and other amenities, and build a 10,000-square-foot clubhouse as part of a 30-year agreement. 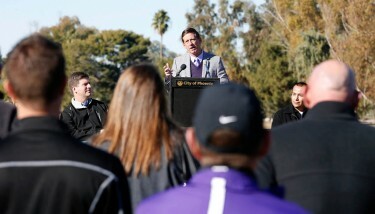 GCU President and CEO Brian Mueller speaks Friday at a groundbreaking to mark the University’s redesign of Maryvale Golf Course in west Phoenix. At Friday’s groundbreaking ceremony, which took place on a 40-degree morning that frosted some of Maryvale’s greens, Phoenix Mayor Greg Stanton said the partnership between the city and GCU is the latest in a series of plans to help reinvigorate the economy and quality of life in west Phoenix. “The more the city partners with Grand Canyon University the better off both of us are,” Stanton said. He added that GCU is “doing more than anyone” to provide higher education opportunities to young people who might otherwise struggle to afford college. He also cited GCU’s efforts to help curb crime and redevelop land in the area which over time has fallen into disrepair. Maryvale Golf Course, city officials said, has lost money in recent years and during its work on balancing the budget, the city considered its options with the land. But feedback from the community suggested residents wanted the city to find a way to keep the affordable municipal course open and provide access to the sport for people from a variety of backgrounds. Stanton joked that he learned to straighten his drives at Maryvale as a child, and he may have tagged a few homes off Indian School Road doing so. GCU and the city envision Maryvale as a hub for golf in west Phoenix and as the home course for the Antelopes men’s and women’s NCAA Division I golf teams. Maryvale Golf Course currently plays about 6,700 total yards, and GCU plans to extend it to 7,200 yards to create a potential site for college and high school tournaments. Located at 59th Avenue and Indian School Road — just three miles west of GCU’s main campus — the course also will remain the center for Maryvale’s men’s and women’s clubs, which will retain their longstanding tradition of hosting events. During GCU’s development of business proposals with the city, local golfers supported the idea of allowing a developer with a heart for west Phoenix to step in to standardize the course. The city will continue to set Maryvale greens fees, which range from $16 to $43 depending on the time of year. GCU will have naming rights under the agreement. On Friday, GCU President and CEO Brian Mueller joined Stanton, Councilman Daniel Valenzuela, City Manager Ed Zuercher, city parks director Jim Burke, parks board member Roger Peck and others to celebrate the Maryvale course transition. Mueller said he hoped the golf course would open as soon as Oct. 1, noting that the same group of stakeholders will be back then to enjoy the first round on the new fairways and greens. Mueller and others join in Friday’s groundbreaking. The goal is for the new course to open in October. Mueller said the idea is to create a flourishing place to help “bring people to west Phoenix and create jobs.” Additionally, he suggested that plans to add a GCU office complex, restaurant, conference center and hotel at 27th Avenue and Camelback Road will create hundreds more jobs in the Canyon Corridor. Mueller also said that GCU anticipates getting its investment back soon once the golf course unveils its new amenities and draws more golfers to the area. The goal is that future revenues — which will be split between GCU and the city — will benefit the community as a whole. Additionally, GCU students will have a hand in managing operations as part of a golf management program being launched this fall by the Colangelo College of Business. Maryvale is one of eight Phoenix public courses. It was built in 1961 by William Bell, who designed the U.S. Open Championship course at Torrey Pines South in San Diego. Over the years, it evolved as a proving ground for local golfers, including some who’ve gone on to fruitful college and professional careers. Valenzuela, the Phoenix City Council’s District 5 representative, said he also learned to play golf at Maryvale. He credited GCU and city leaders for growing relationships to revitalize an area long stigmatized by aging real estate and blight. “That’s what GCU really stands for and what this partnership is all about,” Valenzuela said. GCU not only brings hope to West Phoenix ( Maryvale ) but also fosters sustainable urban revitalization and economic development in our community.